22-May-2004 -- After a failed attempt to visit this Confluence in 2003, this time we were going to make it. The confluence 25S 22E is conveniently situated in the middle of Mabuasehube Game Reserve north of Tsabong in south-eastern Botswana, making it ideal to combine the visit with a camping and game-watching week-end. Four adventurers, David Matthews (UK) and Ferry Krüss (SA) in a Toyota Hilux Double Cab, and Cecilia Bodenstein (SA) and Lars Halldin (Swedish) in a Landcruiser, took off early morning on Thursday 20th May for a six-hour drive on tar roads to Tsabong. We caught a nostalgic glimpse of the lay-bye in Khokhotsa where the Landcruiser broke down last year and we made a quick visit to the Berry Bush game farm near Tsabong. The entrance sign said, "Don't feed the bears. No fishing. Free sand" - quite interesting considering that the nearest bear probably lives in Norway and there is no water at all but oceans of sand in the Kalahari Desert which covers most of Botswana. Filling up every available tank and jerry can with fuel in Tsabong, we set out for the game reserve 120 km due north, half the distance on a smooth gravel road and the second half on a typical Botswana double track sunk into deep soft sand. You easily get stuck which was demonstrated by Ferry. The game park promises 7 years in prison or a 10,000 Pula (2100 US-$) fine if you collect firewood within the reserve, so we decided it would be cheaper to collect it from dead trees on the way. We found the campsite and set up the camp with a beautiful view from a low ridge over Mabuasehube Pan at sunset. The temperature drops by 15° C directly after sunset which makes warm clothing, a large campfire and OBS (Old Brown Sherry) a necessity. Next day we managed to get the borrowed GPS working, it showed the Confluence at only 3.14 km south of the camp. The map, however, showed more like 10 km to the Confluence and it took some thinking before we figured out that the lat-long grid was plotted wrongly on the 1:1,100,000 scale map. An interesting night followed with lions' roaring coming closer and closer until Lars decided to have a look outside the tent at 3 a.m. It was pitch dark but the torch revealed a large animal shape by the campfire, which sent Lars into the car in a split second. A closer look showed that it was a huge brown hyena raiding the camp but who knows how dangerous these things are and the lions kept on roaring nearby anyway, so Lars kept watch inside the car until sunrise prepared to start the engine and try to scare them off with noise and lights, should the lions enter the camp. On Saturday 22nd May the four of us went for the Confluence using the Hilux. The track took us to a point 1.7 km from the Confluence but it turned out to be impossible to get off the track into the bush because the sand was too lose and it's forbidden to drive off-track anyway. So we walked up to it using the GPS, nervously looking for lions, snakes and whatever dangers that lurk in the bush. Large newly dug holes in the sand (probably made by aardvarks) were avoided, as were trees where lions and pythons are likely to be found. It was hot under the sun at midday but the terrain was rather open with grass and thorn bushes, making the walk endurable and the vultures were not yet circling over us, which we saw as a good sign. We reached the Confluence after 20 minutes and it looked like everything else in the area, thorn bush with a few larger trees, grass and sand. We took pictures in the four cardinal directions, of the GPS showing 25°00.000'S 22°00.000'E and of each other. We all felt like Amundsen discovering the South Pole. David had remembered to MOB the position of the vehicle which simplified the return walk and the whole thing took about an hour. We continued with a round-trip to some of the pans and registered a wealth of game, gemsbok, wildebeest, springbok, ostriches, eagles, vultures, etc. And next day we reluctantly had to leave Mabuasehube and return to Gaborone. 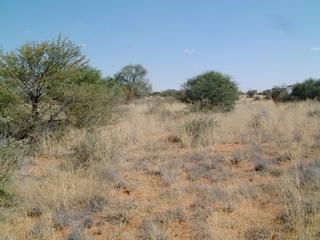 In the Mabuasehube Game Reserve.